Aston-Mansfield alongside other local organisations have played a key role in establishing One Newham. The One Newham vision is to create a strong and collaborative voluntary and community sector which puts the people of Newham at its heart. It is a new entity that will tender for and manage contracts and grants on behalf of consortia of local voluntary and community organisations. It has been set up by local voluntary and community organisations because we are committed to bringing significant new funding into the borough and to ensuring that the voluntary and community sector can continue to play a key role in improving the lives of local people. We will deliver high quality services through local organisations which share opportunities and responsibilities and are rooted in the community to improve the lives of local people. We believe that the creation of One Newham will open new contracting and grant opportunities, promote joint working and encourage organisational learning and development for its members. One Newham’s board is made up of members from local voluntary and community organisations. It will be established as a Charitable Incorporated Organisation (CIO), registered with the Charity Commission. What do One Newham plan to do? · Ensure that services are person-centred and that their need is at the heart of all provision. · Ensure Newham residents have access to consistent, accessible, high-quality and well-resourced services. · Secure funding and contracts to support One Newham member organisations to become, or continue to be, sustainable. · Increase the capacity for consortium members to be more involved in the design and delivery of services and to be able to influence and shape public sector strategic policy. · Develop new ways of joint working and pilot innovative approaches. 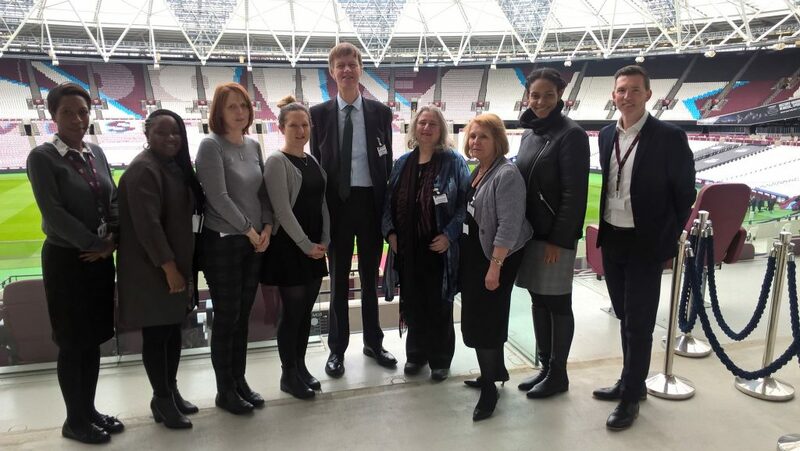 The representatives of One Newham and Stephen Timms MP at West Ham United Foundation.